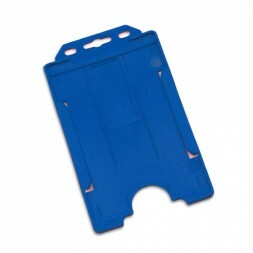 A royal blue ID card holder, designed to protect ID badges and hold them securely in place. This badge holder fits ID cards that measure 86mm x 54mm. This royal blue badge holder is designed to protect ID badges from daily wear and tear and hold them securely in place. This badge holder is in portrait orientation and can also be purchased in landscape. Can be used with lanyards, clips or retractable badge reels - all sold separately.